- In order to trigger The First Step you must not only save the folks in the Museum of Freedom in When Freedom Calls, but you must also follow them to Sanctuary. (Not step by step, but you need to go visit them, at least.) Once there, hunt down Preston and speak to him; he’ll mention settlers elsewhere who need similar help. Agree to help ‘em and you’ll get this quest. 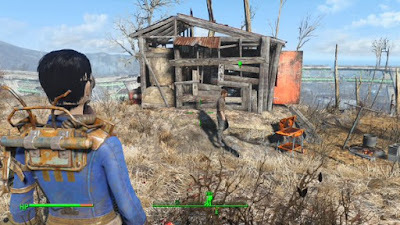 - The First Step takes place at Tenpines Bluff, a settlement to the east of Sanctuary. You can head directly east to get there, but this will take you through rough terrain and past lots of irradiated water. Still, it’s safer than the road, and a bit faster to boot… assuming you’re willing to swim. Be prepared for Bloatflies and possible potshots from the Raiders in the nearby Satellite Station. - Calling Tenpines Bluff a ‘settlement’ is a bit generous, as you’ll discover, but… oh well. There’s virtually nothing of value here, and if you try to enter the wrecked-up shack you’ll get attacked by Radroaches. The NPC you want to speak to is probably in the more complete, rusted-out shack of Tenpines Bluff. 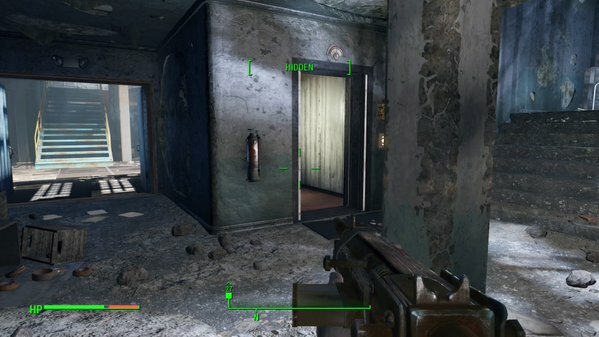 Mention the Minutemen to earn more trust for yourself. You’ll be asked to deal with some Raiders in exchange for an alliance with Tenpines Bluff. 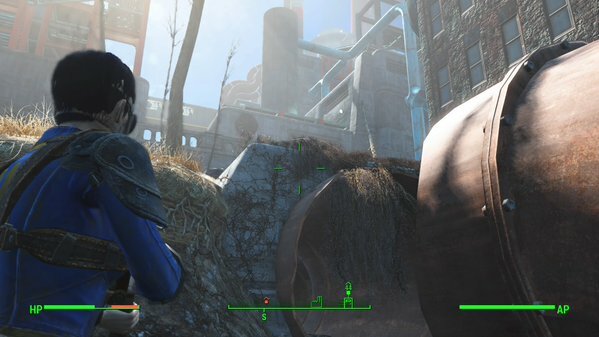 - The Raiders are camped out at the Corvega Assembly Plant in the south. The fastest way to get there is to hop into the valley to the east of Tenpines Bluff and follow the busted-up freeway south. You’ll find Bedford Station and Rotten Landfill this way, and possibly get into scraps with Feral Ghouls and Mole Rats in the process. while visiting Lexington in Fallout 4. Be quiet. Mystic Pines. On the outskirts of Lexington is a large-ish building with a lantern burning out front. There’s nothing of worth inside this old folks home / asylum unless you can open Advanced locks, in which case there are two doors to pop open. One leads to a Fusion Core; the other leads to first aid kits containing two Stimpaks, two RadAways, and a Blood Pack. Feral Ghouls! Yep, these pleasant chaps inhabit the ruins as well. Watch out for ambushes in the narrow streets. If you get lucky you’ll see them scrapping with the Raider Scum patrols. Interject yourself as you see fit. These guys get really dangerous if you decide to enter the buildings, so move with caution. Super Duper Mart. Right in the middle of Lexington is a side area for you to explore. It’s large enough that we’ll look at it somewhere else. Lexington Apartments. East of the Assembly Plant is a large building with stuff to do inside, though, honestly, not much. There is, in short, no lack of things to do in Lexington, and you can muck about to your heart’s content. The Assembly Plant, however, is our immediate concern, and you can find it on the northwest side of town. The Corvega Assembly Plant in Fallout 4. This pipe is the Plant's back entrance. Highly recommended. The Assembly Plant is a sizeable property, and with that size comes some decent risks. If you want you can approach the place head on and engage the Raiders in a sustained gunfight, but if you prefer a quieter approach you can go through the town of Lexington a bit and approach the Plant from the side streets. Here, in the shadow of the Plant, you’ll find a busted-up pipe that you can use for entry instead. We’ll deal with both approaches. Once you’re inside the Plant, one way or another, you’ll find tighter quarters with most of the same enemies, though now you’ll have more places to hide. Regardless of where you come in you’ll start off on a set of upper catwalks, and you’ll need to work your way down. Stay away from spotlights, and be wary of enemies either above or beneath you - they’ll see you (and shoot you) right through the catwalks. Grenades are particularly common weapons here if your foes can’t get at you, but know where you are. Your destination is a cluster of blue-lit offices on the lower floor, not far from a Turret that will try to chew you into mincemeat. If you go through the pipe you’ll find yourself in a narrow space that’s populated by a few Feral Ghouls. 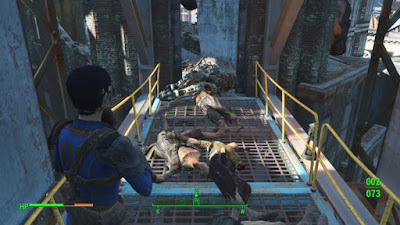 This makes for a nice bottleneck situation, and you’ll also find the Feral Ghouls fighting a Raider when you first enter. Kill your way to a more open area, then check on your left for a small work area with plenty of items (ammo, some Psycho, other assorted items) and a terminal that will tell you more about the Raiders. Watch out for can traps as you proceed. Once you’re past this part and into the Plant you’ll find more thin passages guarded by Raiders. Pick your way through slowly, and, with some luck, you may find your Raiders getting attacked by Feral Ghouls. Take advantage of the chaos to lob a Molotov or two into the fray. There’s a Turret down here, not far from the door where you emerge into the main Plant, so be careful. Again, you’re headed for a cluster of blue-lit offices. The stairs you need to find in the Corvega Assembly Plant in Fallout 4. If you see this elevator, you're almost done. - … and the production floor is full of Raiders! Surprise! So long as you don’t make too much noise you should get the drop on these dopes, fortunately, and your target - a dude named Jared - is within plain sight on a catwalk across from the stairs and elevator. If you pull out a sniper rifle you can headshot Jared and leave without anyone knowing you were there. Jared is carrying a Corvega Safe Key you’ll want, though, so you need to get to his body. Hum. - This room is fairly easy with the element of surprise. There are several Raiders, but they’re typically spread out, and might not even notice you’re fighting in Jared’s vicinity. Headshot Jared to start (if possible), then use the big tanks between yourself and his catwalk as cover for taking out the two Turrets over Jared’s head. Once they’re gone you can move through the area, taking out the remaining Raiders at your leisure. There’s lots of cover to use, both for gunfights and for escaping, and if you’re really hurt you can always flee back down the stairs. - Have a look in Jared’s little office after clearing the area. You can reach it by getting on the catwalk to the left of the entrance and hitting a button to extend a walkway over to the office. Inside, along with lots of ammo, you’ll find a Grognak the Barbarian magazine, sitting beside a computer terminal. The terminal has information on Jared’s plans - what’s that about an old lady and visions? - and options for shutting down the Plant’s Turrets and spotlights. Even if you’ve cleared the Plant, it’s not a bad idea to turn both of these off. - Killing Jared fulfils your obligations, and you can now leave the Plant - only there’s one other thing to address. You have two Keys, one from Gristle and one from Jared (hopefully, anyway), which allow you to open two different locks. The Storage Key allows you to open an ammo dump in the basement, near one of the Turrets that annoys you if you come through the pipe; the Safe Key opens a little safe that’s snugged away under the platform where Jared was standing. (Look for a ‘Keep Out’ sign. So secretive.) Both have reasonable items, but nothing terrible amazing. Yay? - There’s an emergency exit right beside the stairs that you can use to quickly get back outside. There are potentially still baddies out here, but so long as you don’t go too far away from the wall you can quick travel back to Tenpines Bluff from here. Talk to the Settler for your monetary reward, then go back to Sanctuary and talk to Preston to finalize the quest and receive your experience. He’ll then make you General of the Minutemen - assuming you want to be - and become available as a companion. Agree and you’ll get the Raider Troubles at Oberland Station quest. where is the button ? Go left from the stairs, hug the wall, and walk until you find a catwalk. The button's up there, beside a gap. Is there a fusion core? I swear the first time I ran through there was a fusion core., but now I can't find it. Do they spawn in random plants?